Dr. Mike Handler completed medical school at the University of Pittsburgh School of Medicine and completed both his neurosurgery residency and his fellowship at New York University. A professor in the Department of Neurosurgery at the University of Colorado School of Medicine, Dr. Handler holds the McMurry-Seebaum Chair in Pediatric Neurosurgery. He has been the Chief of Pediatric Neurosurgery at Children’s Hospital Colorado since 2005 and has practiced there since 1994. He has been certified by the American Board of Neurological Surgery and the American Board of Pediatric Neurological Surgery. His areas of particular interest include pediatric brain tumors, pediatric epilepsy, and congenital malformations. He has served Children’s Hospital Colorado as President of the Medical Staff and Interim Surgeon-in-Chief and is now the Associate Surgeon-in-Chief. 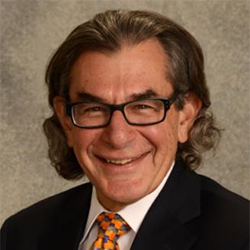 Dr. Handler also serves as Treasurer of the International Society for Pediatric Neurosurgery.